Canon's update to the wildly popular full frame EOS 5D is here. The EOS 5D Mark II has a stunning 21.1-megapixel full-frame CMOS sensor with DIGIC 4 Image Processor, a vast ISO Range of 100-6400 (expandable to ISO L: 50, H1: 12800 and H2: 25600), plus EOS technologies like Auto Lighting Optimizer and Peripheral Illumination Correction. It supports Live View shooting, Live View HD videos, and more. Full HD Video captures at 1920 x 1080 resolution for up to 4GB per clip with HDMI output for HD viewing of stills and video. It can shoot up to 3.9 fps, has 9 AF points plus 6 AF assist points, a new 98% coverage viewfinder, a 3.0-inch Clear View LCD (920,000 dots/VGA) and a rugged build. 3.0-inch Clear View LCD (920,000 dots/VGA) monitor with anti-reflective and scratch-resistant coatings for improved viewing and smudge protection. Compatible with over 60 Canon EF Lenses and most EOS System accessories. Full-frame shooters rejoice! 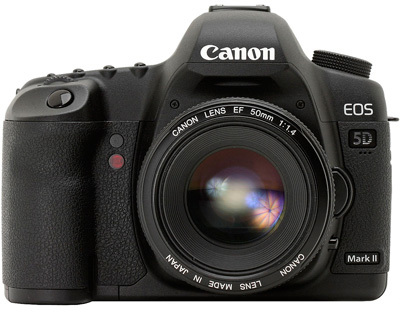 Canon EOS 5D Mark II camera is available for hire from RENTaCAM Sydney.